For a while – the first half of the season – it looked as if he would have trouble reaching even that level of scoring. He had only two goals and two assists in his first 29 games before recording his first multi-point game with the team, a goal and an assist in a 3-2 Gimmick loss to the Philadelphia Flyers on December 21st. By the time he had 39 games under his belt in early January, he was just 3-4-7, minus-1. Then, Eller went on his most sustained period of offensive production of the season, going 7-7-14, plus-16, in an 18-game stretch from January 11th through February 18th. It didn’t last though, as Eller sank back to a 2-2-4, even, scoring line over his last 24 games. It was an odd instance of performance (scoring) not aligning well with production (possession). Eller had the second best shot attempts-for percentage among Caps forwards appearing in at least 20 games (54.63 percent). He was 50.00 percent or better in shot attempts-for percentage in 56 of the 81 games in which he played last season and 60.00 percent or better in 27 of those 81 games. Odd Eller Fact… Lars Eller is the only center in the post-2004-2005 lockout era for the Caps to appear in at least half the team’s games in a season, record fewer than 15 goals and fewer than 15 assists, and record a plus-minus higher than plus-10. And yes, we had to dig deep for that one. Lars Eller played in 81 games last season, a career high for a single season. Don’t think that an insignificant achievement. Since the 2004-2005 lockout, only 16 times has a Caps center appeared in 80 or more games in a season. Nicklas Backstrom has done it six times, and Evgeny Kuznetsov has done it three times. Eller and Jay Beagle (both of whom did it last season) have done it once. That kind of durability down the middle gives the club one less headache in trying to cobble together the necessary ingredients for success. And getting time in those 81 games for Eller last season mattered for Eller and the Caps last season. He skated 23 games with 15 or more minutes, and the Caps were 16-2-5 in those contests. Yeah, but then again, the Caps were 7-1-1 in games in which Eller skated less than 12 minutes, so what’s your point? His ten-game splits weren’t much to brag about, either. He had three or fewer points in six of them. And no goals in the playoffs. He finished the season without a goal in the last 29 games he played, regular and postseason. Under 50 percent on faceoffs in eight of 13 postseason games. A minus player in six of 13 games. And, as a penalty killer (2:10 shorthanded ice time per game), what was up with shorthanded faceoffs? Eller was 65-for-167 (38.9 percent). And all those spiffy possession numbers didn’t really translate into very good performance numbers, although the scoring numbers falling in line with his most recent seasons and the best plus-minus of his career suggested he (and his linemates) were good at the goal prevention thing (as well as the shot suppression thing). Lars Eller has been nothing if not consistent over the past four seasons in his scoring. That consistency, in the context of his recent seasons overall, gave the Caps a certain stability at the third line center position that they have lacked. But within last season itself, Eller did not have a particularly consistent season, nor could it be said he recovered after a slow start with a new club. His late season performance dropped off quite a bit. If the Caps are to be successful this season, they might not be able to afford Eller having one or two point efforts among his ten-game splits (as he did four times last season). That doesn’t suggest his splits regressing to a mean that would result in another 12-goal, 25-point season, but perhaps being a bit more productive on a more consistent basis, perhaps pushing his goal total to 15 or more (which he hit in 2014-2015 with Montreal) and his point total to 30 or so (a total he hit with the Canadiens in 2012-2013). 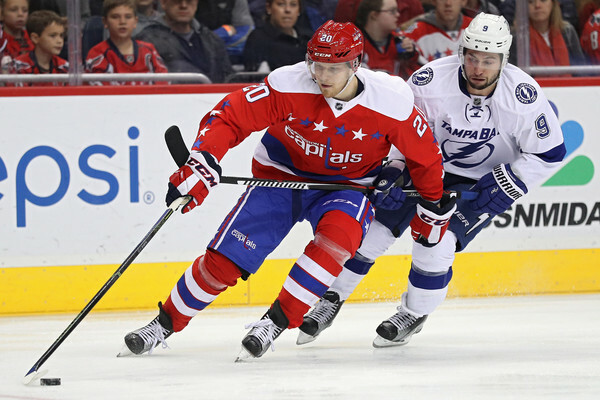 Hitting higher marks in goals and points could be a heavier lift for Lars Eller than it seems. At first blush, it looks like three goals and five points improvement from last season. But then again, he enjoyed a good chemistry with Brett Connolly and Andre Burakovsky on the third line. One or both of those players could be on other lines next season, and it is uncertain who Eller will skate with, let alone whether one can expect a similar chemistry. Eller has put together four very consistent seasons of scoring stats without much regard to shots (he ranged from 117 to 150 over those four seasons), shooting percentage (ranging from 8.7 to 10.4 percent), whether his goal scoring is a product of even strength goals (ranging from 9 to 14) or special teams (ranging from one to three). It speaks to something of an odd profile for Eller. He might take different paths to get there, but he gets to just about the same place every season. The Caps might need something more than that this season. In that sense, his consistency over the last four seasons is a foundation of virtue, but now something has to be built upon it.